"Hola! 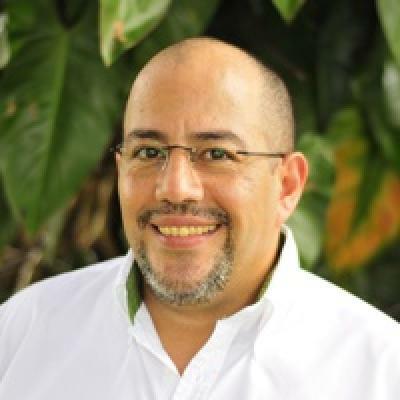 I'm Pablo, Anywhere Costa Rica's Manager/jack of all trades — I’ve been working in tourism for over twenty years. I've been a souvenir shop clerk, a waiter, a bartender, receptionist, and even worked in a coffee shop (which is why I make the best coffee in our office). Out of all the jobs I've had in Tourism, working with Anywhere has been my favorite experience; it has allowed me to share my love of Costa Rica with many people from around the world, and in turn, learn about other cultures and faraway places. I was born and raised in San José. During my childhood, my father worked as a truck driver, and I was often his copilot. These experiences imparted within me a love for the rural areas of Costa Rica, and are a significant reason why I decided to move to Monteverde, which is where I have lived for many years. Nowadays, my wife, son, and I live in La Fortuna with our five dogs — Yogui, Homer, Jack,Troy and Camilo (all rescued dogs). Needless to say, we are an active family! When I’m not working, my family and I love tending to our garden, walking in the park, eating ice cream, and going out to dinner — typical family activities you can look forward to doing during your holiday. My favorite food is casados with fish, and I love natural drinks that are infused with watermelon or mango — I highly suggest that you try each of these during your trip to Costa Rica. Let's be sure and add them to your travel to-do list..."
He was a delight to work with and extremely helpful and kind. Pablo: I have traveled around the world but have never come across a host how was so hospitable and helpful. You have gone out of your way to make us comfortable. Can't forget that. Pablo really went the extra mile, thanks so much! Thanks Pablo. You folks are easy to work with, and everything smooth so far. I will recommend!